Just about everyone uses word processing technology these days, and we are not going to stop downloading and uploading files any time soon. So if you are tired of receiving personal or professional data that you can’t open due to incompatibility, then you need a program that makes converting word to pdf a snap! Ideal for those on strict timelines or business people who need to work with multiple clients at the same time, this converter will make your office run so much more smoothly. When converting Word to PDF, this program first determines whether or not the file is compatible. Keep in mind that you need to be working with Word, Excel, or PowerPoint in Microsoft Office. There are other compatible files, such as HTML, text, or image documents. As long as you have one of those, you will be okay. Next, you need to make sure your file doesn’t exceed 25MB. After that, Just download or locate the desired file from your computer’s folder and click on the program link to have your document converted into a PDF format. It’s as simple as that! Compatibility: - This is the first and foremost attribute you look for in any software program, isn’t it? When it comes to compatibility, this software is great. The Word to PDF converter supports a broad range of file formats such as Word, Excel, PowerPoint, Images and much more. So, no matter what kind of file you have in your hand, chances are this converter would be able to convert them into PDF. The broad compatibility makes sure that you don’t have to go for a bunch of programs to convert various file types. This one is truly your one-stop shop for converting to PDF! Windows Compatibility: - Another great thing about this software is, it is entirely compatible with every version of Windows. Be it Windows 10, Windows 8 or Windows XP you are using; you will be able to use this software with all of them with ease. Excellent Performance: - While reviewing another Word to PDF converter, the greatest issue that we faced was with performance. The file would take ages to get uploaded and then would get converted to a sluggish speed. Delightfully, this is not the case with this one! The software works fast compared to all other converters we reviewed or used so far. Ease of Use: - Ease of use is one attribute that is highly relevant to any program. This Word to PDF converter showcases a super easy interface. You will be able to use it with ease, even if you are a technical handicap. Choice of use: - The converter works perfectly fine online and when downloaded on your computer. In case you use one computer, only you can get the software downloaded on your system and use it for your Word to PDF conversion. You can also use the software online while on the go. And, the best thing is both the versions, i.e. online and downloaded are completely free of cost. This fantastic feature gives you the freedom to use to software anywhere and everywhere; without any restrictions at all. 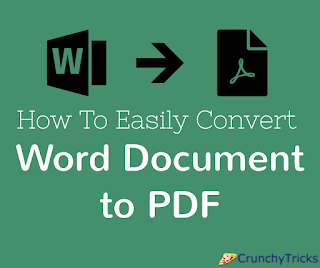 Converting Word to PDF is so useful for both personal and business purposes. You can easily convert files so that you can update your blogs or websites, and you can create business sites and company materials with ease, thanks to a simple online converter. Sometimes you need to collaborate with clients from other departments or companies, and you may need to have a particular file sharing your work with everyone. That’s where this handy converter comes in. Not only can it convert from Word to PDF, but it turns your PDF files (created or received) into the compatible file that you want to read it as. It’s a win-win! If you want this program for your own personal or professional use, then all you need to do is get the free download online. A secure and stable website will provide the download link, and after that, you just need to follow the on-screen instructions to finish installing the converter. Plus, it works on all versions of Windows, so you are sure to find it very convenient for your day to day activities. Also, be sure to tell your friends and colleagues about it so that everyone is on the same page and never has to worry about incompatible or jumbled files ever again.